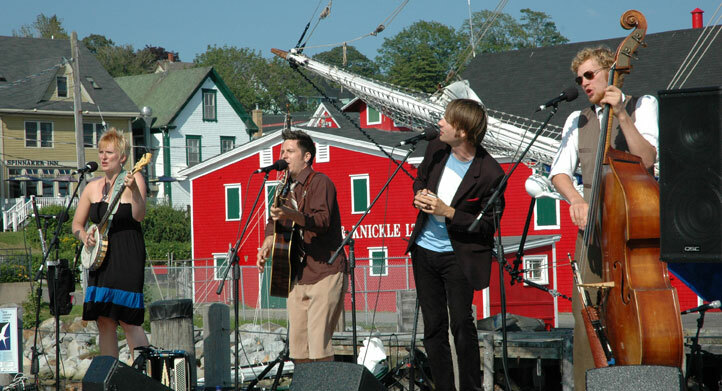 The Lunenburg Folk Harbour Festival brings the best in traditional and contemporary folk music to the beautiful UNESCO World Heritage Site of Lunenburg, Nova Scotia. We are Nova Scotia’s longest-running folk festival and have showcased great Nova Scotian, Canadian and international talent during our 30 years. We are proud to have introduced many of the Maritimes’ best-loved musicians to a wider audience on our stages. Lunenburg literally bursts at the seams with music and Festival goers during the four days of Folk Harbour. With a long history of good weather (knock wood), fantastic music and unmatched atmosphere, music lovers of all ages are in for non-stop entertainment. The Festival officially opens on Thursday with a full day music conference: Folk Steps, usually held in the Zion Lutheran Church, which allows music lovers to examine a theme with experts in that genre of music. The Lunenburg Folk Harbour Society is a non-profit, volunteer-based, family-focused community organization which strives to celebrate the joy of traditional and contemporary folk music, dance, and oral history through an annual festival, monthly concert series and other events during the year. Statement of Artistic Vision: To share traditional and contemporary folk music highlighting the culture and history of Nova Scotia and other North Atlantic regions through music, dance and other forms of artistic expression. This will be presented through events and educational experiences which celebrate the ever-changing nature of traditional music. The Lunenburg Folk Harbour Society was established in 1986. Today, the board consists of 15 local volunteers interested and passionate about promoting Folk music in our community.